Enzo Perez Transfer News: Could Man United Hijack Valencia's Move for Benfica Midfielder? Enzo Perez Transfer News: Could Man United Hijack Valencia’s Move for Benfica Midfielder? 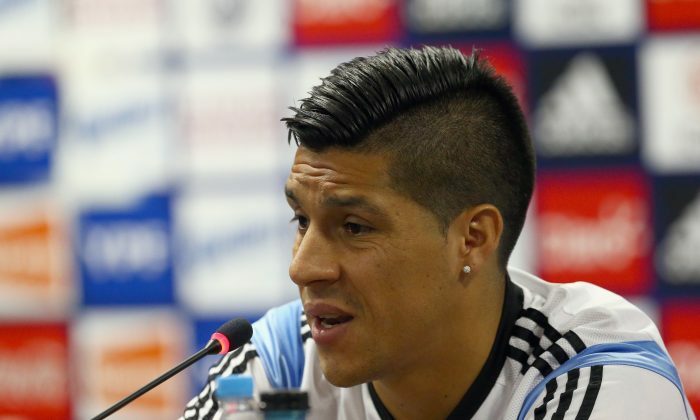 Manchester United could make a move for Benfica’s Enzo Perez. The 28-year-old Argentine international had an excellent last season with Benfica, and is tipped for a £20 million ($34.3 million) move to La Liga side Valencia. However, according to the Mirror, Manchester United could swop in and poach Perez away from Valencia. Perez recently signed a new four-year-contract with Benfica. “I am very happy at Benfica, I signed the contract renewal before traveling to join the Argentina squad, which shows that I want to keep wearing this shirt. See an AP article here. SAO PAULO (AP) — Normally a reserved man who avoids hype, Argentina coach Alejandro Sabella isn’t shy about declaring Lionel Messi to be the best player in the world. Comparing the Argentina captain with Arjen Robben of the Netherlands and Brazil’s Neymar, Sabella on Tuesday held up Messi as the undisputed No. 1. After a disappointing World Cup four years ago, Messi has carried Argentina into the semifinals in Brazil, scoring four goals — the same tally Neymar reached before injury ruled him out of the tournament. Robben, who faces Argentina in the second semifinal on Wednesday, has scored three. Though he’s been named world player of the year for times for his accomplishments with Barcelona, Messi hasn’t had the same kind of success with Argentina, which hasn’t won a major title since the 1993 Copa America. This is the first time since 1990 that Argentina has reached a World Cup semifinal, which Sabella said was a victory in itself. If it does win the semifinal, Argentina won’t have to worry about rival Brazil in the title game. Sabella was just as stunned as everyone else to see Brazil lose 7-1 to Germany in the first semifinal, a game Argentina’s players watched the end of on TV at Itaquerao Stadium, even delaying their training session for around 20 minutes.